As you may, or may not, know I was nominated as one of the Real Men Wear Pink Guys. Have you heard about it? RMWP is a campaign designed, by The American Cancer Society, to have men in their communities raise awareness and money to support breast cancer research in hopes that one day we find a cure. Look out for me wearing something Pink everyday in October. And your help I will dye my hair pink for the duration of the campaign when I reach my goal of raising $1,500 to the cause. I’m asking you to please donate any amount you can to help us find a cure. But you know I believe in win/win/win situations right? So here’s what I’m doing. For a limited time, until I reach my goal, I’m giving gifts to back to you when you donate. If you donate a tier one gift to my Real Men Wear Pink a tier campaign ($1 – $30 donation) I will give you or someone you choose an e-copy of my book Launch and Stand Out. 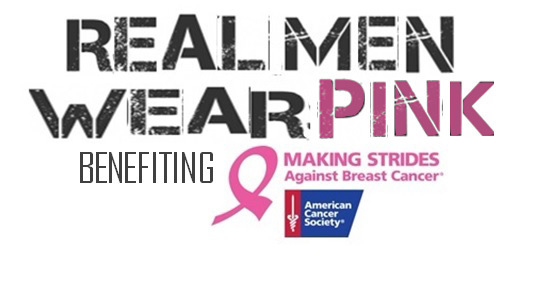 Whatever tier you choose to donate I know myself, the Real Men Wear Pink Campaign, The America Cancer Society and everyone family across world affect by cancer will appreciate you for doing your part to help find a cure. When I beat my goal I will dye my hair pink for the remainder of the campaign! Yes real dye. I will even post a live stream video to my Facebook so you can watch it happen live. The ladies at Ermosa already agreed to Dye my hair. So the only thing that’s missing is your donation. The faster I reach my goal the longer I’ll wear my hair pink.